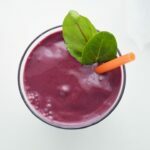 Purple Detox Smoothie - Frugal Mom Eh! It’s the New Year and many of us have made weight-loss related resolutions. Hopefully most of you have been able to stick to your resolution – so far so good over here! 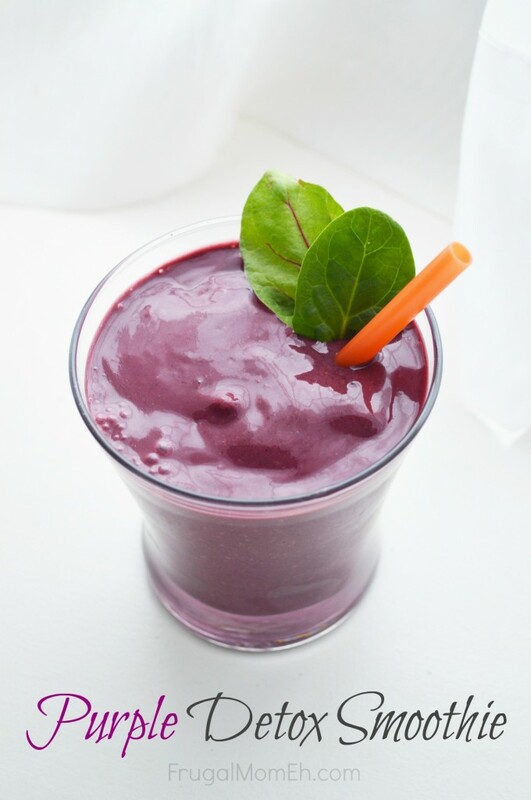 One great way to reach your weight-loss goal is with detox smoothies, and I have a great Purple Detox Smoothie recipe to share with you. This easy to make smoothie is bursting with great flavour and good health. 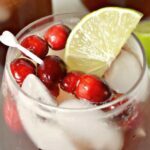 Forget about those liquid detox drinks that force you to plug your nose while chugging it back. This flavourful flush will nourish you with neutralizing, detoxifying and antioxidant rich ingredients. 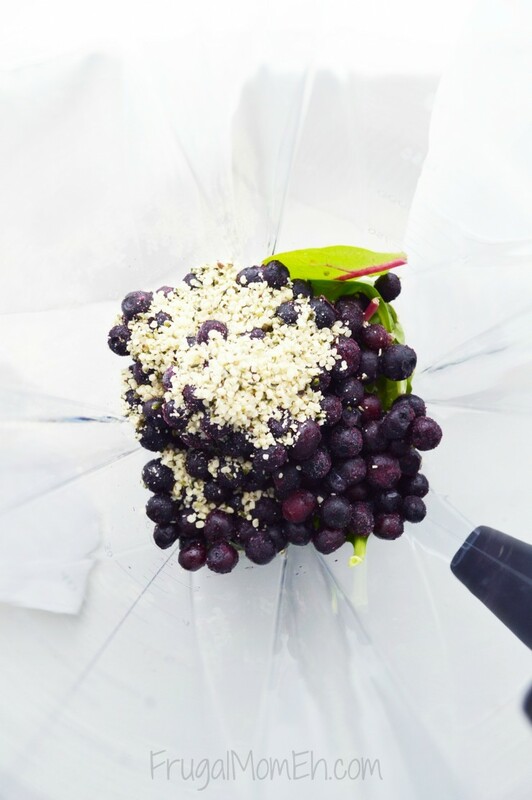 So go grab your blender and whip up the best detox smoothie you’ve ever had! Healthy has never looked or tasted better! Thoroughly wash your greens and rinse your frozen berries. Fresh squeeze your juicing oranges into the blender then add your berry mix, greens and top with the blueberries and hemp hearts. 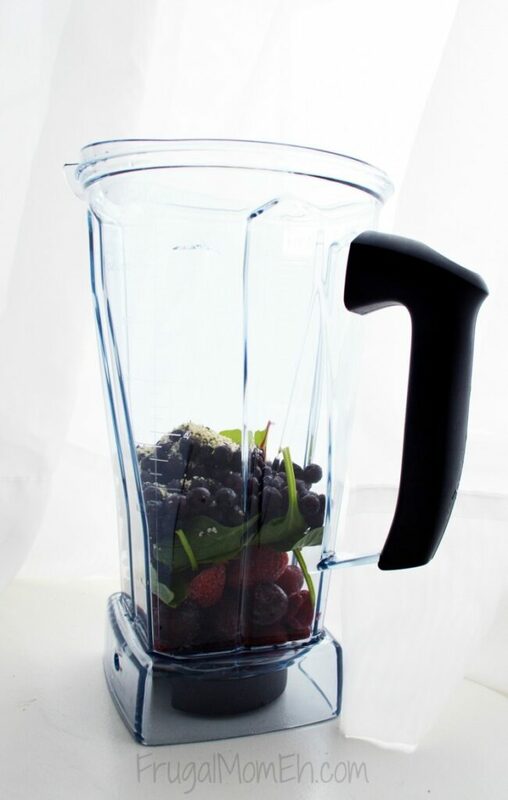 We use a Vitamix blender that processes smoothies in about minute, other blenders may take a little longer. Letting the berries sit out at room temp for a little while will help in the blending process. You may also fill the pitcher to the blender the night before, cover and place in the refrigerator overnight so they will be cold but whip together in seconds in the morning. 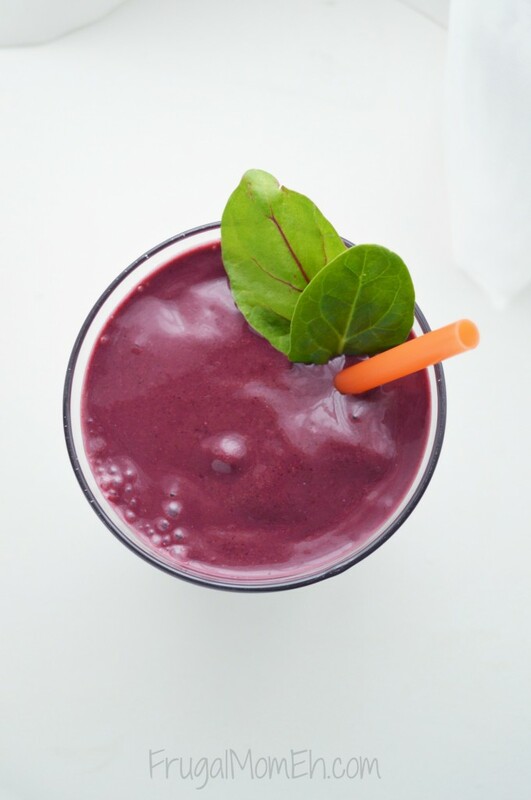 Good luck with your weight-loss resolutions and enjoy the Smoothie! mmmm that looks fabulous!! I’m gonna have to give it a whip up.. i love smoothies! Question – where do you find that frozen berry mix? i love the color. looks great! Would love to try! Where do u get hemp hearts?? If not, any health food store should have them. WOW this looks fantastic. It would be perfect after this past holiday binge! Thanks for sharing! Looks yummy!! will have to try this after I have my baby to lose some weight. That sounds really good! I hadn’t thought of adding hemp hearts to my morning smoothies but that’s a great idea! This sounds delicious! I’ll have to give it a try! Wow, this looks good and is good for you. oh this looks delicious, I can’t wait to try this out! This sure does look yummy! I have to remember hemp hearts…. I want to make this for my husband. He needs to detox! My husband and I have been juicing daily for the past month, we really enjoy it, and have already felt a difference. We love trying new recipes, this one looks great. I wasn’t sure about mixing blueberries and spinaches, but I tried anyway and I liked it very much! I hadn’t thought of putting hemp hearts in a smoothie. That’s a good idea! Although good for you, it sounds really yummy! Thanks! I have tried different smoothies but not this one. It looks really good and healthy, so I will give it a try!! Yumm, this sounds delicious! I’m bookmarking this page because we are going to have one of these very soon! Thanks for sharing, I wish I had a Vitamix! Your Purple Detox Smoothie looks really good. I am trying to lose some weight and I think your smoothie will help me out. I plan to make it soon. Thank you. 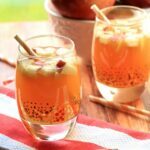 What an easy and healthy way to kick-start your day! Will be trying this very soon! i love smoothies, thank you for sharing! I buy mine in the Health Food/Organic section at Fortino’s and other Sobey’s stores. Goodness Me carries them too. I just tried spinach in my Smoothie a few days ago and I was surprised at how good it was. I will save the above recipe and try it out. It sounds so good. Thank you for the recipe. This looks delicious, we just bought a vitamix and we are looking forward to improving our health with all of the different shakes and smoothies we can make with it. I am open to all and any smoothie combo, the weirder the better. 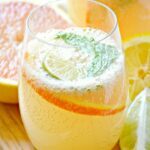 This looks good, and looks like it can do your body good. Looks delicious, I will be trying it for sure! This sounds yummy! Can you replace the hemp hearts with something else? You could leave them out completely or use Chia Seeds. Looks delicious! I love anything with berries! This looks delicious and oh so healthy!!! I can eat frozen berries forever, might as well health it up even more! I love smoothies! Thanks for sharing. This Purple Detox Smoothie looks so delicious & refreshing, I can’t wait to try, thanks for the recipe! Will be trying this, looks healthy and good. What about Weight Loss? Has anyone loss any wei8ght using this smoothie say for about one week two to three days a week?